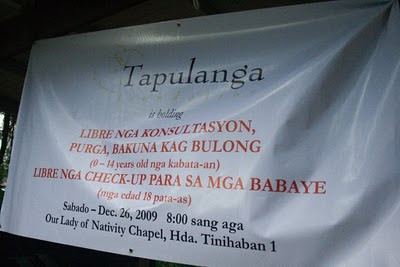 The yearly Medical Mission to more than 100 children ages 0 - 14 of Hacienda Tinihaban, including children of teachers and staff of St. Francis of Assisi School of Silay City, was held last December 26, 2009 at Our Lady of Nativity Chapel, Hda. Tinihaban 1, Silay City. Dra. Joan Ledesma-Millonado, pediatrician, conducted a check-up on the children. 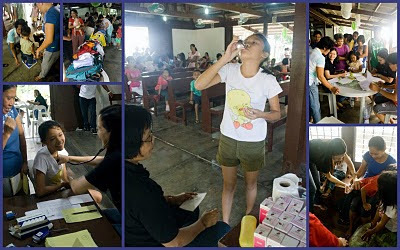 The mission also included deworming, medicines for those who were sick and DPT booster and Tetanus vaccine shots for children who were 4 years of age and up. Families went home as well with some used clothes and toys donated by different donors in Negros and abroad. You can view more photos at our photo gallery (www.tapulanga.org) and this link Tapulanga Medical Mission Dec '09.